For the green, Perfect level Rapidmon, see Rapidmon Perfect. 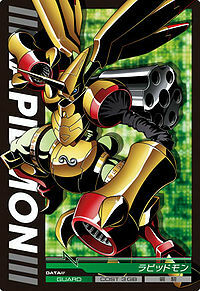 A Holy Knight Digimon that Armor Evolved from Terriermon with the "Digimental of Fate". 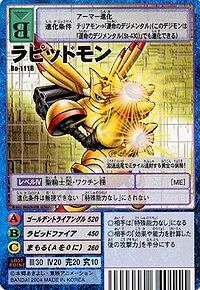 While Rapidmon is originally a Perfect level which evolves from Galgomon, through use of the "Digimental of Fate", it has attained a shining gold form and its power has risen to that of an Ultimate level. 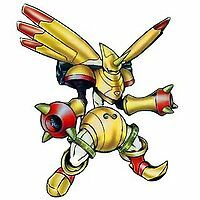 Its Special Moves are rapid-firing homing missiles from both of its arms and the revolver equipped to its back (Rapid Fire), and "Golden Triangle", which is similar in power level to Magnamon's Special Move, "Extreme Jihad". | Rapid 「ラピッド rapiddo」 meaning "fast, swift". 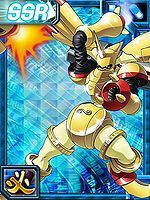 Golden Triangle  ゴールデントライアングル Gōruden Toraianguru Tri Beam/Golden Triangle Fires a triangular beam from its whole body that completely disassembles the enemy's data. Rapid-fires homing missiles from its arms and the revolver on its back. When Seraphimon and Holydramon release the Digimental of Fate it is retrieved by Wallace who uses it to armor evolve Terriermon to Rapidmon. 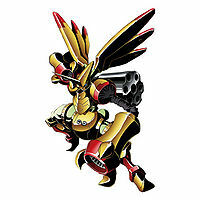 He battled against his brother Cherubimon (Virus) who had been infected with a virus. 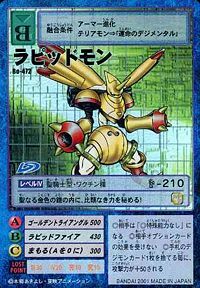 Rapidmon is the Perfect form of Terriermon through Special Card Evolution. 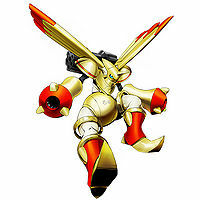 Furthermore, is the Perfect form of Peti Meramon mutant and can further evolve into Death-X-DORUgoramon. 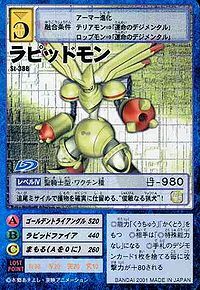 Rapidmon is only obtainable as a collectible card. 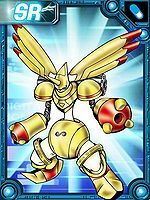 Its card is part of the Digimental of Fate (運命のデジメンタル Unmei no Dejimentaru) set. In the limited edition V-mon version it is the boss of Area 3. It never fails to stop its prey with its homing missiles, a "Keen Hunting Dog"! Lock-on to the target! Its tracking missiles don't let any enemy escape!! Led by fate, this holy knight travels at the speed of sound! Its cannons shine as they align! Hidden within its holy golden armor is a peerless strength! 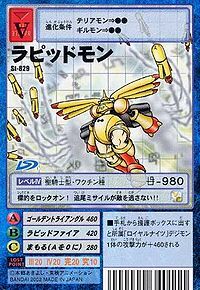 This golden hunting knight rapid-fires missiles that home in at high speed! 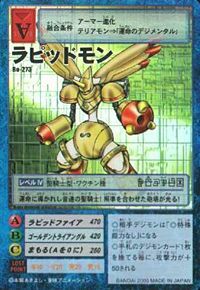 Terriermon's Armor Evolved form using the Digimental of Fate. 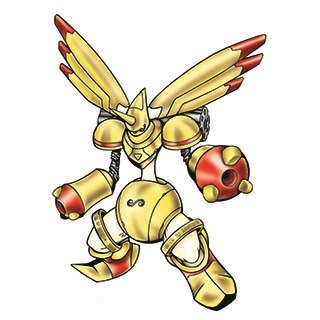 Due to having undergone Armor Evolution, it sports a golden body different from its regular variation, and is able to draw out power rivaling that of an Ultimate level.